Cardiovascular disease accounts for roughly one in every three deaths in the USA with heart disease accounting for the majority of these cases1. The pathology of heart disease often involves the death or dysfunction of cardiomyocytes, specialized heart cells that produce the contractile, beating function of the heart. Many different proteins and cell machinery, such as ion channels and pumps, cytoskeletal proteins, and receptors play a significant role in regulating the contractile ability of cardiomyocytes. Interestingly, many of these proteins are regulated through post-translational modifications (PTMs), in part because PTMs allow for rapid, but subtle changes to a protein as part of an overall cellular response2. For example, SUMOylation of the critical sarco/endoplasmic reticulum Ca2+-ATPase 2a (SERCA2a) pump was diminished in failing human heart samples3. Interestingly, restoration of SUMOylated SERCA2a was sufficient to repair cardiomyocyte function, implicating SUMOylated SERCA2a as a potential target for therapeutic intervention. Indeed, N106, a recently developed small molecule that triggers and maintains SUMOylation of SERCA2a via activation of the SUMO-activating enzyme E1 ligase, improved ventricular function in mice with heart failure4. There are many other examples of PTM-modified proteins playing a critical role in cardiomyocyte function and progression of heart failure2. Here, we will highlight three examples where post-translationally modified cytoskeletal proteins facilitate cardiomyocyte contraction and normal heart function. Fig 1. 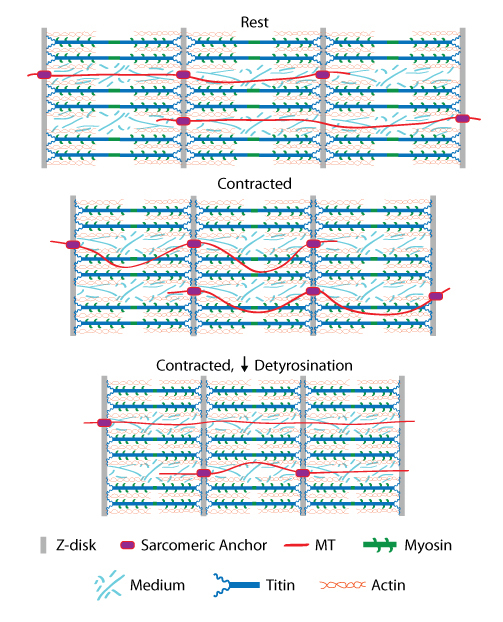 Diagram of microtubules (MTs) attached to sarcomeres in a cardiomyocyte under resting conditions (A). In response to systolic contraction, MTs buckle to accommodate the changing geometry of the myocyte (B). When MT detyrosination is reduced, attachment to the sarcomere decreases, resulting in a sliding rather than buckling action of the MT (C). Microtubules (MTs) play several roles in cardiomyocytes including functioning as compression-resistant elements, performing transport functions, and relaying signaling by converting contractile forces to intracellular signals5. MTs are formed by the polymerization of α/ß-tubulin heterodimers. In particular, the c-terminal tail of α -tubulin is heavily modified by PTMs including glutamylation, acetylation, and detyrosination6. Several studies have linked tubulin PTMs to progression of human disease. There is a particular focus on detyrosination of α-tubulin, the cleavage of the C-terminal tyrosine residue on the α-tubulin tail. Detyrosination increased cytoskeletal stiffness and altered cardiomyocte function as this modification affects MT-based mechanotransduction7. Use of SiR-tubulin technology to perform high-speed, sub-diffraction imaging revealed that detyrosination of α-tubulin was critical for anchoring MTs to sarcomeres in order to regulate MT buckling during contraction8 (Fig. 1). Furthermore, detyrosination was significantly increased in patients with clinically diagnosed hypertrophic and dilated cardiomyopathies, while acetylation and glycosylation of α-tubulin did not play a significant role in MT buckling8. It will be interesting to determine which PTMs regulate alternative functions of MTs in heart disease. Desmin is a muscle-specific intermediate filament protein that forms a scaffold for the contractile machinery in cardiomyocytes, and desmin mutations play a significant role in various heart diseases and are classified as desmin-related myopathies (DRM)5. Desmin is a highly modified protein, undergoing phosphorylation, ubiquitination, and ADP-ribosylation, among other PTMs9. Importantly, these modifications are implicated in desmin dysfunction and progression of muscle-related diseases. For example, in myofibrils prepared from dissected muscles of food-deprived mice, desmin is phosphorylated, which marks it for subsequent ubiquitination and degradation, decreasing desmin protein levels10. It is unknown whether this mechanism occurs in cardiomyocytes under pathologic conditions; however, other studies identified phosphorylation of desmin as a modification altered in heart disease11. Because desmin is so highly modified by PTMs, it will be interesting to determine how important PTM crosstalk is for regulating desmin expression, cleavage, and function as it relates to heart disease. Activity of the trimeric troponin complex is controlled by calcium and in turn the complex regulates tropomyosin’s position on actin thin filaments and is a key regulator of sarcomere contraction. One component of the troponin complex, cardiac troponin I (cTnI), functions as a critical regulator of sarcomere contraction, and is an important biomarker of heart disease due to its degradation and appearance in the blood12. Phosphorylation of cTnI at several sites is thought to affect troponin complex formation and cardiomyocyte function, and is altered in human heart disease12. Little is known about other potential PTMs of cTnI; although, a proteomic study on purified cTnI from human heart showed that cTnI can also be acetylated, oxidized and/or cleaved, in addition to being phosphorylated13. However, this study may have missed other modifications such as ubiquitination or SUMOylation as the analysis was performed on a single gel band. Whether these lesser known or yet to be identified PTMs of cTnI regulate its function in heart disease remains unknown; however, these PTMs are deserving of intensive research as cTnI is a critical disease biomarker. 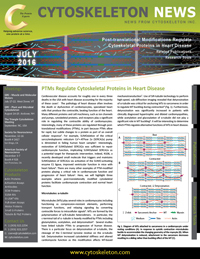 This newsletter discusses the importance and prevalence of PTMs on cytoskeletal proteins and how they can have significant effects on human health and disease like heart failure. Importantly, the emergence of PTMs as potential therapeutic targets for treatment of heart disease is highlighted. With the development of novel tools to identify new PTM targets, it is much more feasible to discover novel PTM dependent mechanisms regulating cytoskeletal proteins. To assist researchers, Cytoskeleton, Inc. offers Signal Seeker™ Kits designed to analyze post-translationally modified proteins under endogenous, physiologic conditions, which are critical to gain a meaningful picture of their role in disease progression. Mozaffarian D. et al. 2016. Executive Summary: Heart Disease and stroke Statistics – 2016 Update. Circulation. 133, 447-454. Liddy K. et al. 2013. Functional decorations: post-translational modifications and heart disease delineated by targeted proteomics. Genome Med. 5, 20. Kho C. et al. 2011. SUMO1-dependent modulation of SERCA2a in heart failure. Nature. 477, 601-605. Kho C. et al. 2015. Small-molecule activation of SERCA2a SUMOylation for the treatment of heart failure. Nat. Commun. 6, 7229. Sequeria V. et al. 2014. The physiological role of cardiac cytoskeleton and its alterations in heart failure. Biochim. Biophys. Acta. 1838, 700-722. Magiera M. and Janke C. 2014. Post-translational modifications of tubulin. Curr. Biol. 24, R351-354. Kerr J. et al. 2015. Detyrosinated microtubules modulate mechanotransduction in heart and skeletal muscle. Nat. Commun. 6, 8526. Robison R. et al. 2016. Detyrosinated microtubules buckle and bear load in contracting cardiomyocytes. Science. 352, aaf0659. Capetanaki Y. et al. 2015. Desmin related disease: A matter of cell survival failure. Curr. Opin. Cell Biol. 32, 113-120. Cohen S. et al. 2012. Ubiquitylation by Trim32 causes coupled loss of desmin, Z-bands, and thin filaments in muscle atrophy. J. Cell Biol. 198, 575-589. Agnetti G. et al. 2014. Desmin modifications associate with amyloid-like oligomers deposition in heart failure. Cardiovasc. Res. 102, 24-34. Wijnker P.J.M. et al. 2014. Troponin I phosphorylation in human myocardium in health and disease. Neth. Heart J. 22, 463-469. Zabrouskov V. et al. 2008. Unraveling molecular complexity of phosphorylated human cardiac troponin I by top down electron capture dissociation/electron transfer dissociation mass spectrometry. Mol. Cell Proteomics. 7, 1838-1849.